You lift my foot gently from the hospital bed and enclose it in the flannel, hot at first, then warm as you press carefully around my heel, the fleshy part at the base of each toe, then the top. You glance at me, trying to gauge whether the pressure is okay, whether this is going down well. I nod and try to say ‘lovely,’ but speaking has become difficult. Your eyes give everything away, they have done since you were a small child, and I am grateful when you bend your head and continue. Your hair is dark now, one or two strands of grey like I had at your age. You dip the flannel into the bowl of hot water and begin on the other foot, and I close my eyes because I know you will look up at me again, wishing that your hands could do more than bring this temporary pleasure. When you are done with the flannel you smooth on some lotion and begin to work it in in small, slow circles. 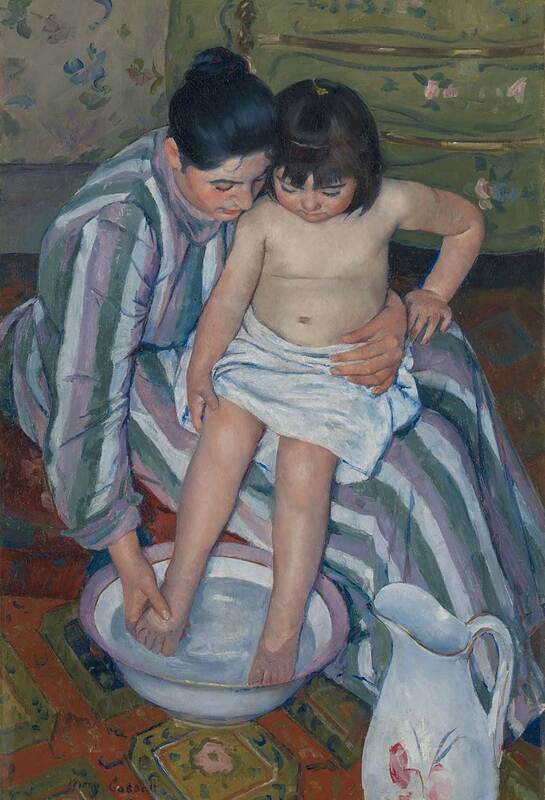 I relax back into the pillow and remember that you used to love me washing your feet as a child after you’d been barefoot in the garden all day, sitting still on my lap as I took one foot, then the other, and rubbed off mud and sand with my thumb. I can feel now the way each foot fitted perfectly into my hand. Is this what has made you come here with your flannel and your lotion today? Do you remember the big cracked enamel bowl we used, and the way the late afternoon sun slanted through the window where we used to sit, always in the same chair in the kitchen? Afterwards you would run off and join your sister and the noise and the squabbling would start up again, and I would scold and wish for you to hurry up and grow older. I grow drowsy from the rhythm of your hands and the morphine, and marvel at the bending and warping of time and how we think we know it but we don’t. I don’t know if it’s my feet I can feel now or yours – whether I am wishing for time to slow down, stop right here in this moment, or speed up so that you can return to your own child, wrap her in a white towel on your lap, and wash the day from her feet.